- the part of a drawing that appears to be in the distance or behind the most important part. - the way in which the parts of something are arranged, especially the parts of a visual image. - a design or plan showing the way things are arranged. - the act or process of combining things to form a whole. - the use of tonal differences, between the lightest and the darkest parts of the drawing. - the degree of clarity of an image. It is related to the sharpness and degree of contrast in the image. - the part of the drawing that appears nearest the viewer. - a drawing quality with expression and movement. The idea of realism does not need to be a priority. - the extent or relative size of something. - the difference between light and dark shading in the drawing. This links to highlights, shadows and the use of contrast. Graphite is a crystalline form of carbon and is useful as a writing and drawing tool, as only the slightest pressure is needed to leave a mark. However, as graphite is soft and brittle it requires some form of protective casing. The exact date and origin of the first graphite pencils is unknown but it is thought that the first graphite sticks encased in wood appeared around 1565, shortly after the discovery of natural graphite in Cumberland in Britain. Graphite also occurs naturally in Siberia, Bavaria in Germany, and in the United States of America. It can, however be made artificially by heating cokes at high temperatures, known as the Asheson process. 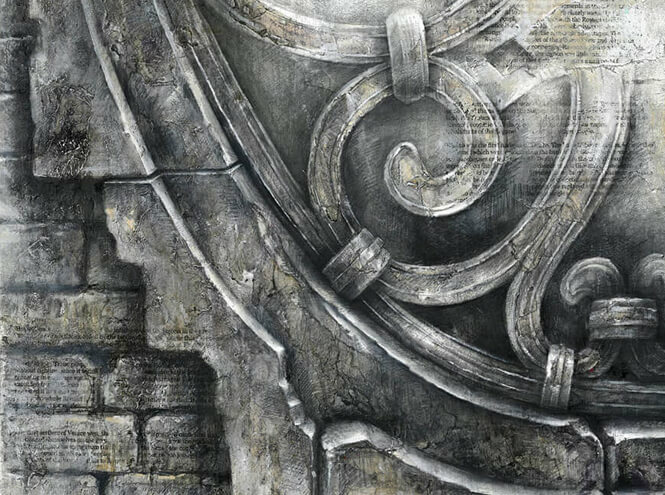 Graphite has a greasy texture and is dull metallic grey in colour. Graphite is a stable and permanent material but can easily be removed using an eraser. 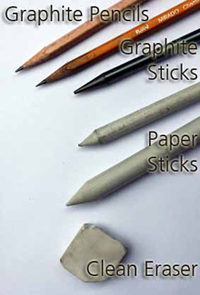 Today graphite is referred to as 'pencil' or occasionally 'lead pencil'. This name came about because prior to the discovery of graphite, lead had been used since ancient times as a writing tool. Graphite was thought to be a form of lead until 1779, when KW Scheele, a Swedish chemist, discovered that the so-called lead used in pencils, was in fact a mineral form of carbon. It was named 'graphite' from the Greek word for writing. The term pencil derives from the Latin word for brush, 'penicillum'. Pastel sticks or crayons consist of pure powdered pigment combined with a binder. Oil pastel (also called wax oil crayon) is a painting and drawing medium with characteristics similar to pastels and wax crayons. Unlike "soft" or "French" pastel sticks, which are made with a gum or methyl cellulose binder, oil pastels consist of pigment mixed with a non-drying oil and wax binder. These have a soft, buttery consistency and intense colors. They are slightly more difficult to blend than soft pastels, but do not require a fixative.